What keeps you returning year after year? Every agricultural educator deserves recognition for his or her efforts, so be sure to apply for an award this year or nominate another deserving educator or partner in your ag ed program. state agricultural educators’ association for details. Please note that there have been some changes this year some awards, and some awards programs are pending sponsorship. All changes are detailed on the awards application page of the NAAE website. Ag Teachers - The Best of the Best! 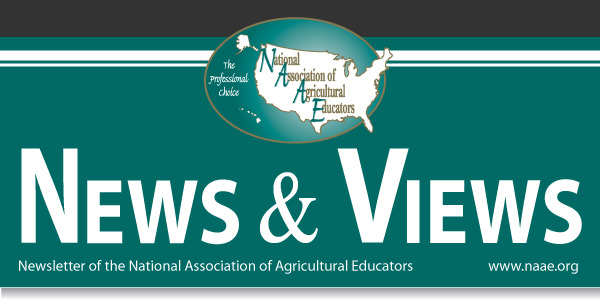 NAAE Regional Conferences are a great way to connect this summer with other agricultural educators from your area of the country and, in many cases, a way to get some good professional development at the same time. Click on your Region below for more information about its conference. Not sure which Region you're in? Click here for a map. Kathleen Weaver, an agriculture teacher at David Hinson Middle School in Daytona Beach, Fla. uses the George Washington Carver Milk Jug Hydroponics Challenge to teach her students about alternative plant propagation techniques in a way that allows them to be active, hands-on learners. As I write this piece, I have just learned that my United States Representative, Ben Chandler, has signed on as a co-sponsor of H.Res. 886, the National Teach Ag Day resolution, and H.R. 3464, the National FFA Commemorative Coin Act. This is great news … and I am grateful to my Congressman for taking this action in support of our profession. Forward this email to a friend.| Unsubscribe.